Clinically proven pain-relief in 14 days or less. Canada’s top selling joint health care product. Join the tens of thousands of Canadians already enjoying life pain free. SierraSil is an all-natural mineral complex sourced from the Sierra Mountains that helps calm inflammation and gently detoxify for improved mobility and flexibility. SierraSil is for anyone with aches and pains whether related to age, activity and even some health conditions. It has been extensively tested for both safety and efficacy including double-blind, randomized, placebo controlled trials – and offers guaranteed results in 14 days or less. If you’re looking for a safe and natural alternative to OTC’s, look no further. 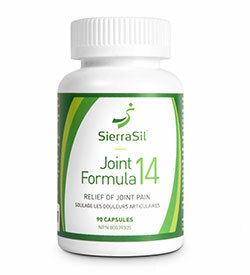 Pain comes naturally and so can relief with SierraSil Joint Formula 14.